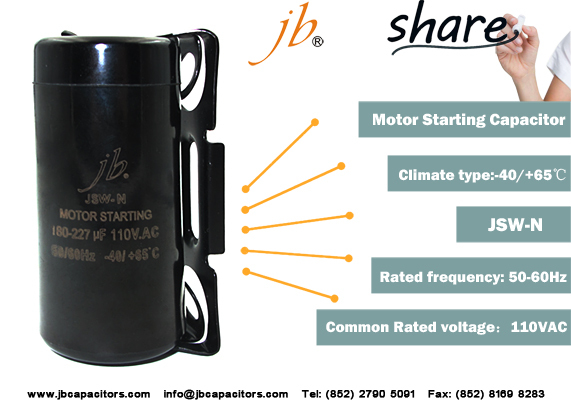 jb keeps expanding our production line and launching more product support to our oversea customers. Today we also increase a new product called JSW-G (SPP6) motor torque multiplier (hard starter). 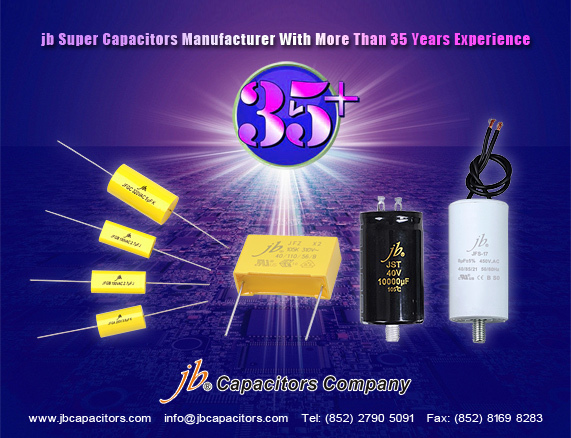 Whose case size is 46X86mm, capacitance range 130uf-156uf , rated voltage 115VAC -277VAC, increased torque 200% - 500% and recommended range 1/2-4HP. 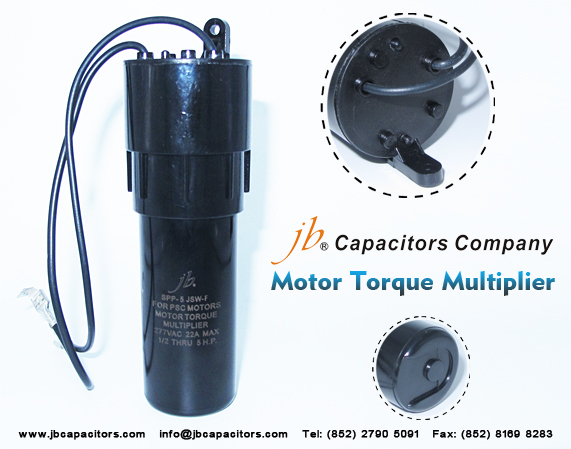 It mainly applies to start the heavy duty motors on compressors heat pump, air conditioning, freezers, refrigerators etc. 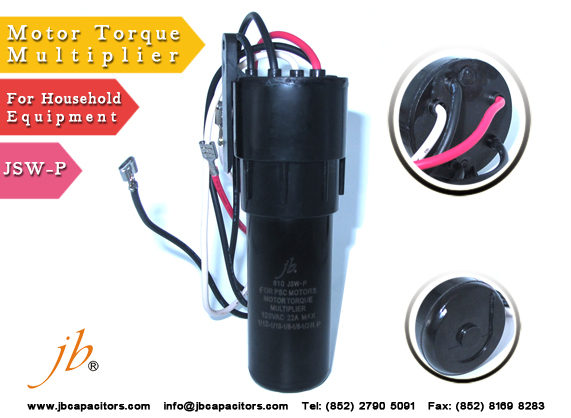 When motor starting, it provides higher torque. 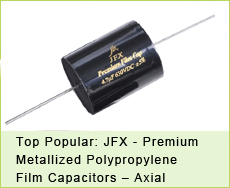 We are offering our client an excellent quality range of motor starting capacitor. JSW-N is manufactured from qualitative range of raw materials, which is quality checked by our team of experienced professionals. 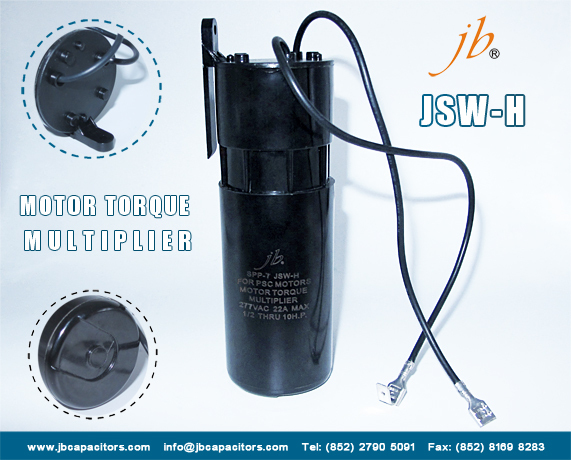 We offer the JSW-N at most competitive prices. 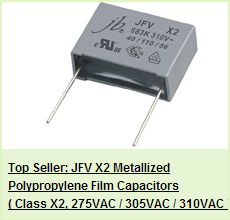 Hi dear friends, are you sourcing competitive prices of capacitors supplier? But always suffering from bad quality products? Are you disgust such terrible experience? 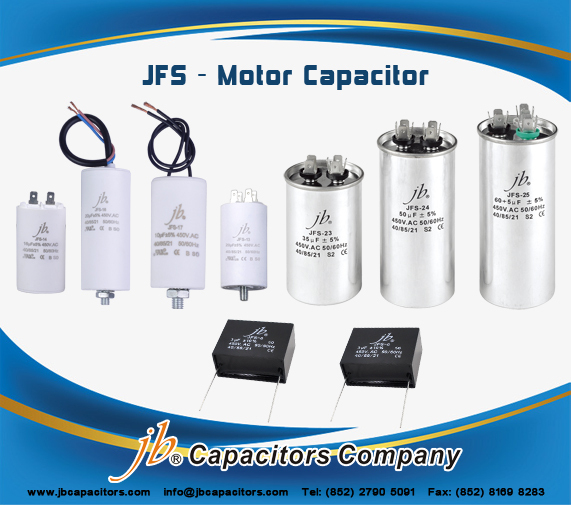 Please just focus hear, jb capacitors company here help you out. 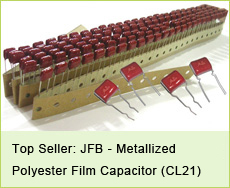 Since 1980, jb capacitors company dedicates to develop and produce film capacitors and aluminum electrolytic capacitors, such as MKP/MKT film capacitors, motor running capacitors and SMD, Radial, Large Can Aluminum Electrolytic Capacitors and etc. Custom dimension available as well. What's more, supplying with stable high quality products and competitive prices are our eternal pursuit. 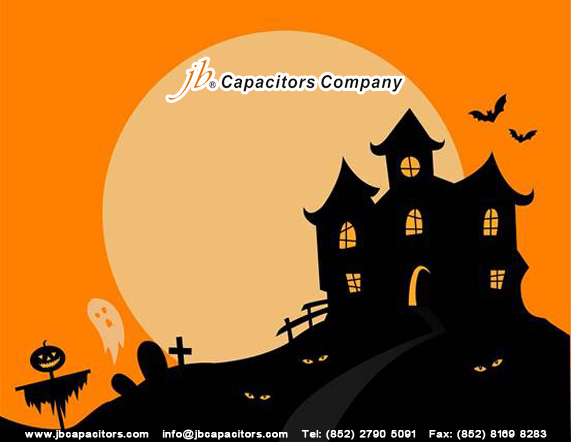 jb capacitors brand gain a great reputation from worldwide, and we aim to reach a win-win relationship with our business partners. Sincerely we are ready here to offer you excellent services, should have any possible inquiry please be free to send us, let's help you cost down. Great thanks. cost-performance ration products can meet your requirement. 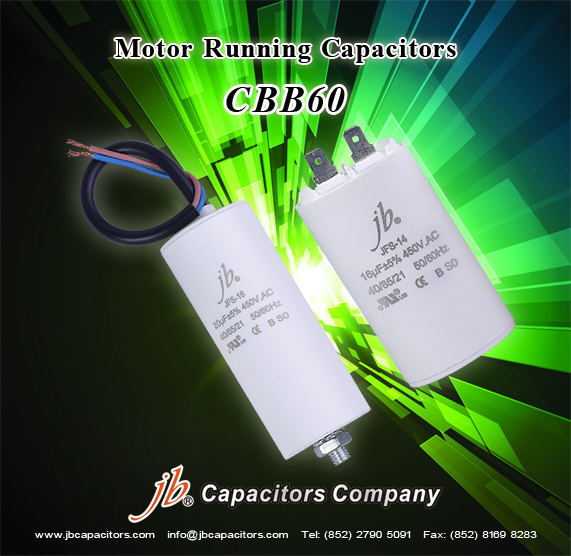 CBB61 series motor run capacitor has features of small size, light weight, small tangent in waste angle, and good self-concrescence. 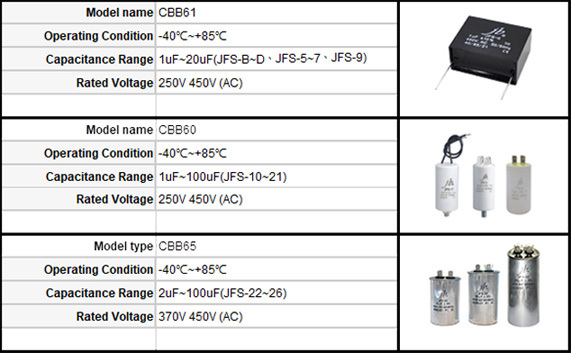 It is widely used for air-conditioners, fan, Pump, illuminating lamps, etc. 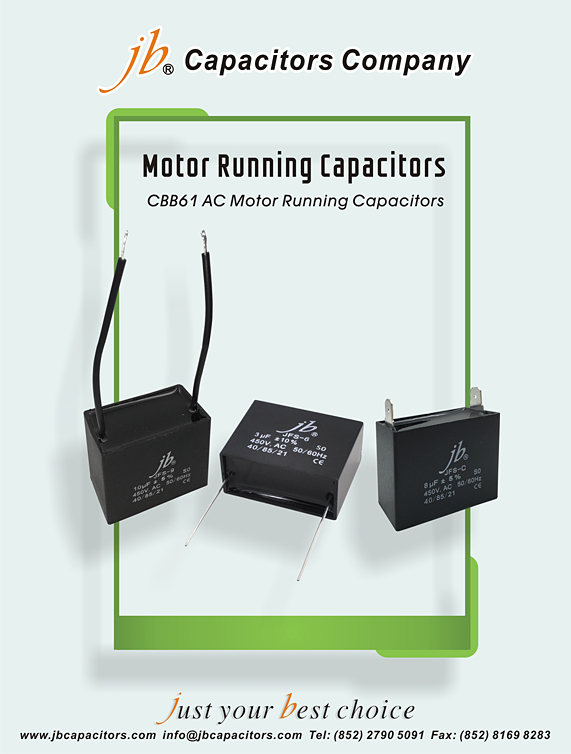 For starting and running, these types of capacitor can continuously working at the rated frequency and voltage. We hope to establish a long-term & mutual beneficial partnership with you in the near future.